The 2017 analytics reports are now in. They show huge gains in eNews readership, continuing growth in Twitter followers, and website traffic holding steady. The last year also saw significant improvements and additions to the voluminous information on the Court’s website. This eNews highlights what’s new in the Provincial Court’s digital communications. The Court published eNews on its website weekly until October 2017 and bi-weekly thereafter. The articles contain news about Court innovation, judicial officers’ work and activities, BC justice system resources, and explanations of Court procedures. eNews earned 35,928 page views in 2017 – an increase of 60.43% over 2016 – and a healthy readership for a Canadian trial court. The Court’s Twitter followers continued to increase steadily – 2017 saw a 48% increase to 1191. Not large in the Twitter universe, but significant for a provincial trial court. 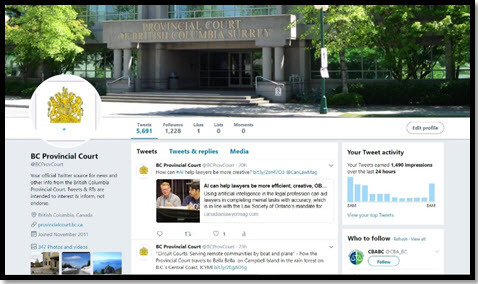 "@BCProvCourt is a very active Twitter handle and tweets regularly on topics related to the courts, law and related developments. … This is one of the most open and transparent courts in the world and it is setting an example of how a traditional institution does not have to be locked into a traditional mindset. Of course this all comes from leadership at the top and staff that support an innovative approach to courts, dispute resolution and the role of courts in society." “Our Twitter Town Hall wasn’t just a one-off event intended to make a splash. It was part of the Court’s ongoing communication initiatives dedicated to two-way engagement with the public. 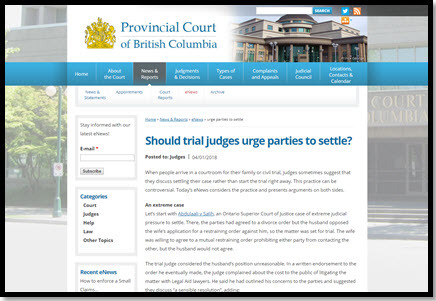 Other courts have taken notice of the BC Provincial Court’s initiatives. In 2017 Canadian administrative tribunals and courts at all levels consulted the Court’s Digital Communications Co-ordinator, Judge Ann Rounthwaite (retired), and the Chief Judge about their use of social media and eNews bulletins. Tweeting that “imitation is the sincerest form of flattery”, the Nova Scotia Courts announced a Law Day Twitter Town Hall, #AskaNSJudge, last spring. 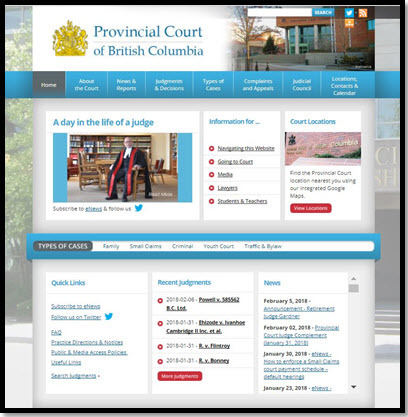 The Provincial Court of BC sees its online communications as part of a continuum of interaction with the public. From a judge speaking to a community group, spending lunch hour with students on a courthouse visit, or sharing perspectives in an eNews article, to the Chief Judge hosting a Twitter Town Hall, the Court is committed to transparency and meaningful engagement with the public.